These durable, vinyl hanger caps allow you to display your products on a peg board hook or slat wall while offering excellent hold and product protection. 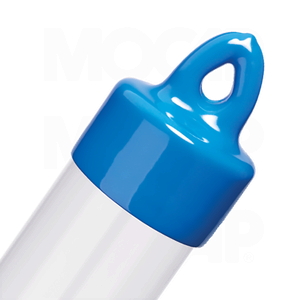 The hanger caps can be used on our thin, sealed bottom or heavy wall tubes and are available in a wide variety of standard colours. Our Vinyl Hanger Caps are available for 13.4mm/13.9mm, 20.2mm/20.5mm, 27.6mm/27.8mm, 34.4mm/34.6mm, 41.6mm/41.8mm, 43.0mm/43.4mm and 52.2mm/52.6mm size tubes.